Hundreds of people marked the sixth-month anniversary of Thailand's coup with a protest Sunday demanding the quick restoration of democracy. The protesters marched in Bangkok for the second consecutive night ahead of Monday's six-month anniversary of the Sept. 19 coup that ousted Prime Minister Thaksin Shinawatra. Demonstrators called for the resignation of the interim government that was installed by the military coup leaders and demanded elections be held immediately. The government of interim Prime Minister Surayud Chulanont has vowed to step down after elections scheduled for the end of the year. 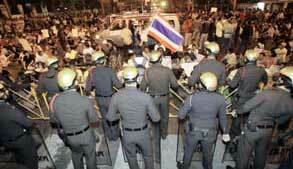 Protesters marched from Sanam Luang to the home of the Thai king's chief adviser, Gen. Prem Tinsulanonda.